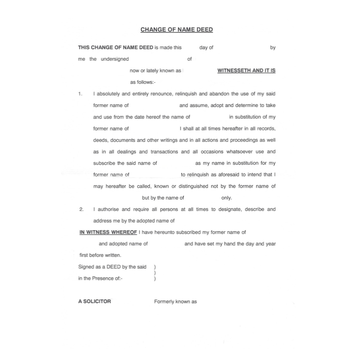 A deed poll is a formal legal document that can be used to change your name. This can be a document you have created yourself or a template obtained from a solicitor or deed poll agency. When you sign the document the witness could be anyone; whether this is a friend, a colleague or a family member. However, in order for the apostille to be issued the document would need to be certified by a UK solicitor or Notary Public. For ONLY £54* we arrange for your deed poll to be issued with the apostille. * The fee is £54.00 assuming you have already had the document certified by a UK solicitor or Notary Public. If this has not yet been done please contact us for advice. How should the document be certified? In order for the deed poll to take effect the individual changing their name should have their signature on the document witnessed. The witness can be anyone however, if you intend to get an apostille for this document, we recommend signing the document in the presence of a UK solicitor or notary public. If your document has already been witnessed by an individual who is not a legal official then the document can be countersigned by a solicitor or a notary in order for the apostille to be issued. How to order an apostille for your deed poll? Firstly, you must ensure that the document has been signed by a UK solicitor or notary public. Following this, simply purchase your apostille online and post the original signed document to us.